The Catholic Priest Ernesto Pellegrino Maria Ernetti in 1960 claimed that he had built by means of quantum physics a very interesting device a time viewer (Chronovisor) and he also said he had taken a picture of Jesus dying on the cross. Although even a book was written about the construction of the first time machine in history, we already knew that it was not true, since at the present time, we still lack of the technological capacity to build a time machine, these machines and the chronovisor were a reality in the year 2500 though. IS IT POSSIBLE TO BUILD A TIME VIEWER? Interlocutor: Here I have scheduled a question about something strange. I mean to an artifact called "Chronovisor" that allegedly is a device that would take pictures and record sounds of the past. Ruanel: It is a temporary device that allows to visualize the past and even is capable to take pictures of the past. Interlocutor: Does this artifact exist at this present moment? Ruanel: It will be achieved in the future, but for the time being it doesn't exist. Interlocutor: I have some reports that I searched over the Internet here, where a priest called Alfredo Pellegrino Maria Ernetti said he have invented it and that the Pope Pius XII prohibited the use of this device and they had it locked in the Vatican. 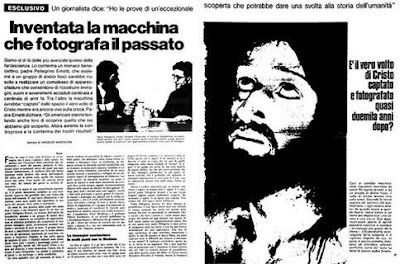 This priest was completely discredited when a picture of a face of Jesus crucified was discovered and it was a photo montage of a real image that was in a church. Ruanel: I repeat that at this present time the artifact doesn't exist. All the statements on this respect are false. Interlocutor: Let’s see if I understand: What Ernetti recorded is nothing more than what we call EVP (Electronic voice phenomenon) captured voices that the spirits of error produce making focus to make fun of us? Interlocutor: Was this made in bad faith? Ruanel: No, this priest and his collaborators believed that they made it. Chronovision doesn't have anything to do with EVP, but this person confused them, not only helped by the spirits of error, but also by his mental decoder that hallucinated. Interlocutor: Was this priest insane? Ruanel: If one would start evaluating the functioning of the decoders of the human beings, the conclusion would be that in a very high percentage they have it unbalanced. Interlocutor: So they are insane. Interlocutor: To conclude with this topic I will sum it up to see if I understood correctly: Ernetti achieved what is denominated "EVPs" and he thought that it was chronovision and this is the whole story. Am I right? Ruanel: Correct. His unbalanced decoder, along with his enthusiasm made him believe it. Interlocutor: I have other questions to ask you, but they are many and I’d rather leave them for the next session. Ruanel: Okay, I leave all my Light with you. This entry was posted at Saturday, November 07, 2009 and is filed under Secrets . You can follow any responses to this entry through the .